Many people affected by the California wildfires are stranded and in a state of limbo. Here's how you can help. Monica H. Evans, 44, lived in her home in Paradise, California for 19 years. She and her husband, a veteran who relies on his pension as income, were happy there with their three children and nine pets, and they had a great deal on rent — just $412 a month. Evans and her family (pets included) were able to escape the deadly fires, but lost their home. Right now, they’re staying with a friend in Orland — in a single room — and have until the end of the week before they have to find other lodgings — a transition that Evans breaks into sobs at the mere mention of, because they have nowhere to go. 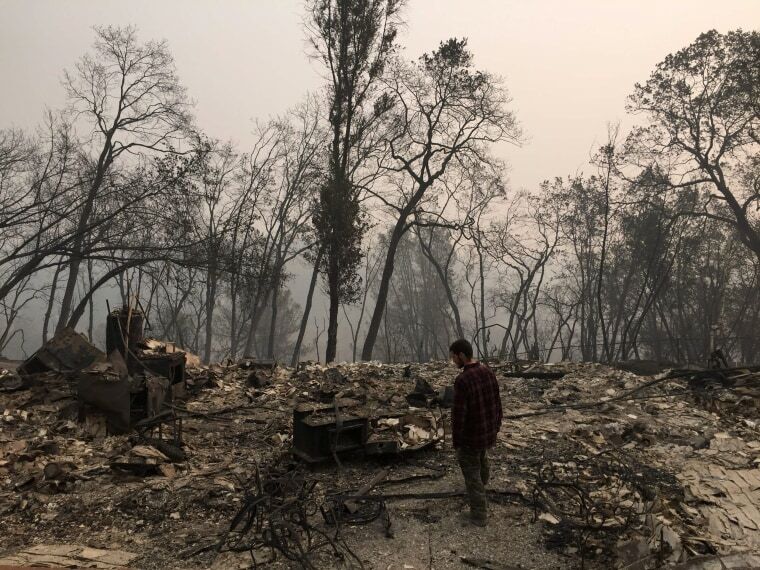 All those who have lost their homes in the fires have been dealt a terrible blow, but lower income renters such as Evans, who did not have renter’s insurance (as of 2016 research by the Insurance Information Institute, only 41 percent of renters did), are faced with a particularly difficult recovery ahead. With no payout from insurance and no land they can rebuild on, many have turned to parking lots for shelter, waiting for help. The housing crisis is severe, with Larry Olmstead, president and CEO of United Way of Northern California highlighting that the homelessness in Butte County and Shasta County was a challenging problem to solve even even before the fires. Some people who lived and worked in Paradise, didn’t just lose their homes — they may have also lost their jobs. Heather Milstred, 29, also a former resident of Paradise is staying with a family friend in Shasta Lake who has generously opened her home to her, her boyfriend, their two young daughters, along with other displaced family members and their pets. Michael R. Hart, a spokesperson for FEMA says that the organization is urging people who are trying to get back on their feet to take one of two steps: If they have insurance, file a claim. If they are uninsured or under-insured, set up a case. If you're a victim and can make it to a FEMA recovery center, go there, but know that you can also set up a case by calling 800-621-3362 of visiting online disasterassistance.gov. Hart says that there are still evacuation centers accepting people, while others are at capacity. Note that some welcome pets (including large animals as well). See the Butte County, Los Angeles County and Ventura County web sites for up-to-date information on evacuation centers. Milstred and Evans emphasize their gratitude for donations of clothing, but right now they have nowhere to store anything non-essential. Getting stuff without a home to put it in, is only adding to the anxiousness of being homeless. Hart adds that clothing donations also create a logistics/manpower issue on the ground. FEMA, a government entity, does not accept donations, but they are working closely with non-profits that are relying on donations. Hart urges people who want to donate to make sure that whichever charity you choose has been approved by National Voluntary Organizations Active in Disaster (VOAD). California Fire Foundation. Through its SAVE program, the California Fire Foundation is distributing $250 cash gift cards for those who have lost their homes. “Anyone who has suffered a loss of more than 25 percent of their home can get a gift card for $250 per household,” says Carroll Willis, communications director at the California Fire Foundation and the California Professional Firefighters. United Way (Greater Los Angeles) and United Way of Northern California. Olmstead says that it is working both with immediate financial aid for survivors and on long-term recovery efforts. California Community Foundation, assisting with long-term recovery efforts and people who have been displaced and/or unemployed because of the fires. This organization also supports mental health services. North Valley Community Foundation, which is offering grocery and other gift cards available at the Chico Posse Foundation. Ventura County Community Foundation allows survivors to sign up and apply for funds. AirBNB has an Open Homes program through which you can donate a temporary living space. This is a very practical way to help if you have a spare room nearby or other property near the impacted areas. Volunteering in the affected areas is another great way to help. Anthony C. Tornetta, spokesperson for the Red Cross, reminds us that the Red Cross is 90-percent volunteer based. Tornetta also encourages those wanting to give assistance to donate blood, if able.